You will never find a ski resort so close to the sea as this one, situated to the northern side of Pelion offering a magnificent view of the Aegean and Chalkidiki 346 km from Athens, 27 km from Volos and 2 km from Chania settlement. You can reach it by car following the Athens-Lamia national road towards Volos. The trip duration is five hours. You can also use the bus for €23,50 and a trip duration of four and a half hours. 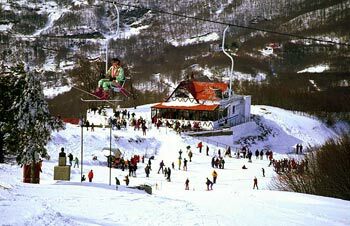 Pelion ski resort is installed on the top from where you will have the opportunity to admire the Aegean, the Sporades islands and Chalkidiki. It has an altitude of 1471 m at its highest point while the installations start from 1170 m.
There are seven skiing sites of a total length of 12 km. There is a total of 5 lifts including a baby lift for beginners. Daily from 9:00 am till 16:00 pm from December to March. The daily card costs €13 for weekdays and €17 for holidays. The discount cards cost €9 after 13:00 on weekdays and €12 on weekends. The yearly discount card costs €130 while the ticket for pedestrians for just one ride and a stop to the chalet costs €6. 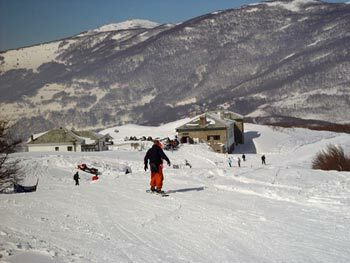 It is warm and hospitable and it is named after the highest point of the resort. You will find it in the heart of the resort. It includes various rooms for €30 and a hotel called Pleiades just a few meters away. There, you can have some coffee or something to eat. One of the oldest ski schools operates on the premises. Private lessons cost €25. €40 for two persons and €15 for groups of three. Having your instructor with you for the whole day will cost you €150. You can rent anything you want on the premises. The cost ranges from €15 for a day and €35 for 3 days. Snowboard boots cost €20 for a day and the slay €6 per hour. 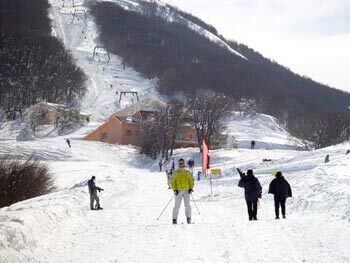 Kentauros site is ideal for experienced skiers. At the base of its lift there is a reception desk for information, tickets and maps. Night skiing events are organized for the bold ones on Saturday night. Panorama is unique in Greece and all over the world. You will find it in between a variety of trees with a wonderful view of the sea. Portaria Xenia Palace offers great rooms along with spa and sauna for those interested and prices range from €104 for a double room. Tel no (+30) 24280-99980. Aleka’ s guest house is a small, atmospheric and warm place to stay with prices ranging from €90 for a double room. Tel no (+30) 24260-49380. In addition, take a look at Amanita guest house tel no (+30) 24260-49707, Anovolios hotel, tel no (+30) 24280-86893 and Montana mansion tel no (+30) 24230-86900. 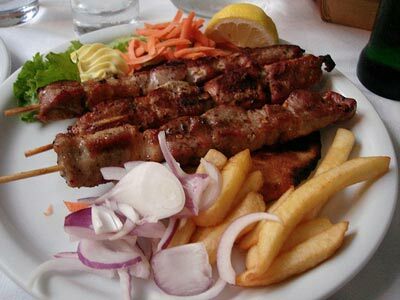 They will both offer you Mediterranean cuisine, traditional dishes and hot soup. By taxi (+30) 24280-99350, Volos’ buses (+30) 24210-25527. Medical Center available on the premises of the ski resort. 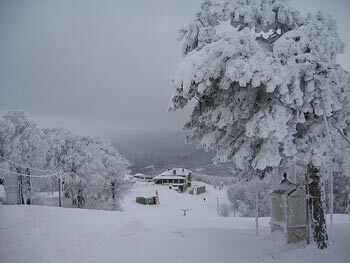 Pelion ski resort (+30) 24280-73719.